Henri was born into a Dutch family in 1932. Recalling his childhood, he was known to say: “I grew up in a very protected and safe environment and I learned to know that I was Dutch and I was Catholic. It took me quite a long time to discover that there were people, many people, who were neither!” His upbringing was religious and he would remark that he was familiar with two voices growing up: the voice of his mother offering unconditional love and the voice of his father spurring him onward to achievement and effort. For Henri, these voices would serve as constant companions and narrators for his life's actions. At the age of six, he says he first felt a calling to be a priest and servant of God's people. This is a calling that he would follow through school and eventually see realized when he as ordained a priest at the age of 25. Henri's gifts were clearly disposed toward teaching and writing. His writing is--to this day--regarded highly among protestants, orthodox, and roman catholics. The decided difference in Henri's approach was his incredible passion for pastoral theology. This passion led him to study the relatively novel discipline of psychology (a discipline still distrusted by much of the Church) with vigor and apply it to his already considerable theological understanding. In this, Henri began cautiously to plumb the depths of the minds of those he served. He taught psychology and pastoral theology for many years at schools such as the University of Notre Dame and Yale University Divinity School. During this period, he wrote prolifically and magnificently. But, he still felt something was missing and he was haunted by many of his own personal terrors and challenges. In 1981, Henri moved to Peru to serve the poor and discern if God was calling him to work among the people of the developing South. He left the academic regard and salary to serve among the poor and needy of Peru but, ultimately, found that this didn't feel like where God was calling him even if it was good work that he would continue as he served in other places. This work changed Henri for the better and further deepened his commitment to social justice and ministry to the poor but wasn't the last stop on his journey of calling. In 1983, he accepted a position at Harvard University Divinity School that many academics would covet--he was required to teach only one semester and was encouraged to write as much as he wanted to. His classes were popular. His influence and fame were notable. Yet, Henri was overcome by the depression that had haunted him for most of his adult life. He found this to be a place of darkness and discomfort. In his journals, he would confess to conflict over his vow of celibacy and his incredible desire for physical and emotional intimacy with another person. This was a place where Henri continued his long struggle with his own sexuality and its implications for his spiritual life. Henri felt that Harvard was a great school but lacking in any feelings of communion. The competition and ambition of its students overtook their calling to love one another and be with each other. Henri resisted this place of darkness and isolation throughout his life--as far as we know--but it was at Harvard where so much of it came to bear upon him and lead to what he alternatively referred to as "burnout" and "spiritual death." A seeming coincidence brought Henri together with Jean Vanier who told Henri about the communities that he was starting called L'Arche. These communities were meant to be places of intentional communion for people of all varieties. They were noted for taking in many people with intellectual disabilities. 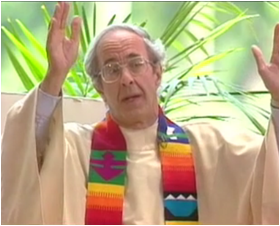 In 1986, Henri became the pastor of one of the L'Arche communities--called "Daybreak"--outside of Toronto, Canada. Still deep within his own depression and darkness, this was a challenging time that he relates in his book Adam, God's Beloved. Henri--the famous and influential author, priest, and activist--was asked to take care of a man named Adam who had a severe intellectual disability. Henri felt unappreciated and belittled at first. After all, surely he could be more useful in some other capacity. Yet, Adam became the key to Henri's release from his own darkness. Taking care of Adam--waking him, dressing him, helping him bathe--reminded Henri of the power of love to redeem even the darkest pits. As Henri loved Adam and Adam loved Henri, they were both further converted to life. It was at Daybreak that Henri finally found community and happiness. It was in the simple act of offering unconditional love that Henri found rest and comfort to his soul. Henri died from a heart attack in 1996. He was buried near Daybreak.